Kangaroo Island is one of the best regions in South Australia for a self-drive holiday using your own car or a hire car (feel free to ask us about hire car options). Take a holiday at your own pace, choose what regions and activities suit you best. The below are some packages to help you make your holiday. To book the following packages you can call us on 13 13 01, email us, or fill out our online enquiry form. Experience KI's local wine, food, wildlife and spectacular scenery on your own self-drive holiday staying at Vivonne Bay Lodge, set on 206 hectares of natural Australian bushland with 1km beach frontage. On Island Hire Car option with Budget Rent-A-Car Kangaroo Island also available (Tour Code: SHBP) From $471* per person twin share or $321.50* per person based on 4-share. Additional nights at Vivonne Bay Lodge available if you want to stay longer! *From prices are based on low season car hire rates. High season rates apply for Budget Rent-A-Car KI. Prices valid from 1st of April 2019 to 31st of March 2020, for other dates please enquire. *From price is based on low season rates. High season rates apply from 19th to 22nd April 2019 and 14th December 2019 to 31st January 2020. Two night package is not available between 19th to 22nd April 2019 and 14th December 2019 to 31st January 2020 due to a 3 night minimum stay required but additional nights at Vivonne Bay Holiday House can be added to the package at high season rates. Prices valid 1st April 2019 to 31st March 2020 for other dates please enquire. 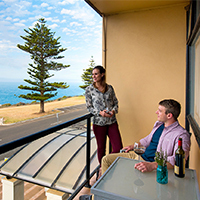 Enjoy superb ocean views from your accommodation at Emu Bay Holiday Homes, situated on the north Coast of Kangaroo Island. From here you can explore the island at your own pace. On Island Hire Car option with Budget Rent-A-Car Kangaroo Island also available (Tour Code: EBHC) From $559* per person, twin share. *From prices are per person, twin share during low season and based on staying in Rustic Cabin. 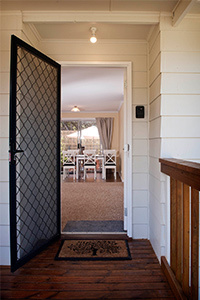 Other accommodation types may be available at Emu Bay Holiday Homes and package price will vary accordingly. High and Mid Season rates apply. A four night minimum stay is required between 17th to 23rd December 2019 and 14th to 28th January 2020. A seven night minimum stay is required between 24th December 2019 to 13th January 2020. Prices valid from 1st of April 2019 to 31 March 2020 for other dates please enquire. 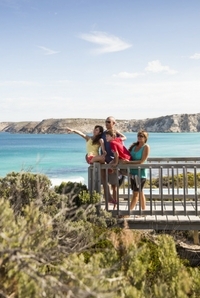 There’s nothing better than being with your family and exploring a great destination like Kangaroo Island. There are so many fun things to see and do and this package including just a few of the Island’s most popular experiences. On Island Hire Car option with Budget Rent-A-Car Kangaroo Island available from $533.50* per person, twin share OR $1,369* per family^ (Tour Code: FEHC). *From prices are based on low season rates. High season rates apply from 19th to 22nd April 2019 and 14th December 2019 to 31st January 2020. Two night package is not available between 19th to 22nd April 2019 and 14th December 2019 to 31st January 2020 due to a 3 night minimum stay required but additional nights at Vivonne Bay Holiday House can be added to the package at high season rates. ^Family prices are based on 2 adults and 2 children. Prices valid 1st April 2019 to 31st March 2020 for other dates please enquire. Base yourself at the quiet, friendly fishing village of American River and discover the eastern end of Kangaroo Island. On Island Hire Car option with Budget Rent-A-Car Kangaroo Island also available (Tour Code: ARHC) From $589.50* per person, twin share. *From prices are per person, twin share during low season and based on staying in a Superior Queen Poolview room. Other room types may be available at the Mercure KI Lodge and package price will vary accordingly. Normal Season rates apply. Prices valid from 1st of April 2019 to 31st March 2020 for other dates please enquire. Experience Kangaroo Island's local produce and spectacular scenery whilst staying at Kangaroo Island Seafront in Penneshaw. 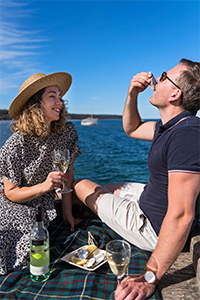 Gourmet lunch at Dudley Wines which includes a Tasting Platter consisting of a selection of meats, cheeses, house-made delights, fresh produce and Kangaroo Island condiments and 2 glasses of wine or soft drink per person. Child's lunch includes ham, cheese & pineapple sub and juice. On Island Hire Car option with Budget Rent-A-Car Kangaroo Island also available (Tour Code: FWHC) From $656.50* per person, twin share. *From prices are per person, twin share, low season and based on staying in a Sorrento's Room. Other room types may be available at the KI Seafront and package price will vary accordingly. High Season rates apply for Budget Rent-A-Car KI. Prices valid from 1st of April 2019 to 31st March 2020 for other dates please enquire. It's time to take your loved one away on that short break you have been wanting to do for so long. On Island Hire Car option with Budget Rent-A-Car Kangaroo Island also available (Tour Code: IHHC) From $715.50* per person, twin share. *From prices are per person, twin share, low season and based on staying in an Executive Room. Other room types may be available at the Ozone Hotel and package price will vary accordingly. High Season rates apply for Budget Rent-A-Car KI. Prices valid from 1st of April 2019 to 31st March 2020 for other dates please enquire. See Kangaroo Island from “East to West” with this great package including return ferry travel to Kangaroo Island, 2 nights’ accommodation in Kingscote and 2 nights down at the western end near Flinders Chase National Park. On Island Hire Car option with Budget Rent-A-Car Kangaroo Island also available (Tour Code: EKIHC) From $836* per person, twin share. *From prices are per person, twin share during low season and based on staying in a Ocean View Room at KI Seaside Inn and a Courtyard Suite at the KI Wilderness Retreat. Other accommodation may be available and package price will vary accordingly. High Season rates apply. Prices valid from 1st of April 2019 to 31st March 2020 for other dates please enquire. Join Dave, Leeza and their amazing Kangaroo Island attraction, Birds of Prey, for an educational, interactive and inspiring experience. Meet an array of birds including Jedda, the majestic Wedge Tailed Eagle, enjoy a delightful interactive experience with Casper the friendly Barn Owl and meet Banjo and Clancy, the laughing Kookaburras. *From price is per person, twin share staying in a Private Room with Shared Facilities at Vivonne Bay Lodge. Price valid from 1st of April 2019 to 31st of March 2020, for other dates please enquire. Haven't found what you are after? Why not build your own self-drive holiday package or take a look at the online Kangaroo Island map for inspiration. See our range of self-drive packages or build your own! Save on return ferry travel and accommodation when booking the two together. Purchase accommodation, then just add accommodation and you will receive a save upto $56! With over 90 accommodation options on Kangaroo Island from luxury accommodation to the best camping spots or holiday houses, you're bound to find a property you'll love. Jump online and take a look at the digital KI map. 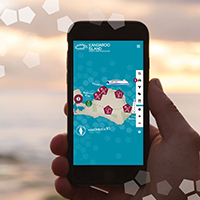 Use the interactive map to plan your itinerary to Kangaroo Island and navigate around the island, to each location. The map features great spots to eat and drink, including farm gates, cellar doors, restaurants, cafes, markets and pop up events on the island. The map is regularly updated so unlike a printed map it's always up-to-date! Use your smart phone or tablet to start building your own personalised itinerary.